The thing about Chinese food in California is the vegetables. With cities like Los Angeles and San Francisco only a stone’s throw away from major agricultural areas, “fresh” takes on a whole new meaning there. When you mix that with the fact that Chinese cuisine really plays up vegetables and lets them stand on their own, you can find some of the best Chinese food in America. 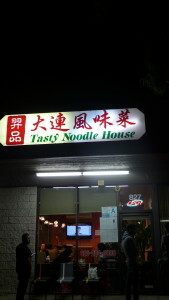 And some of the best Chinese food in America is exactly what I found last Friday night in a tiny little restaurant called Tasty Noodle House located in a nondescript strip mall in San Gabriel valley, just outside of LA proper. With three other friends, one who is a vegetarian, we ordered large with a total of eight dishes. While the waitress told us at dish six that we over ordered, the food is so amazing that, by the time we were done with our meal, not a single scrap was left. Some of this had to do with the fact that we were starving after a day of hiking, but also Tasty Noodle House goes light on the oil, allowing the flavors of the food to stand on its own. But even without the heavy oil, the food is authentic and the place is perfectly Chinese – a bathroom that can only be found by walking through the narrow kitchen and Mandarin soaps on the flat screen TV. 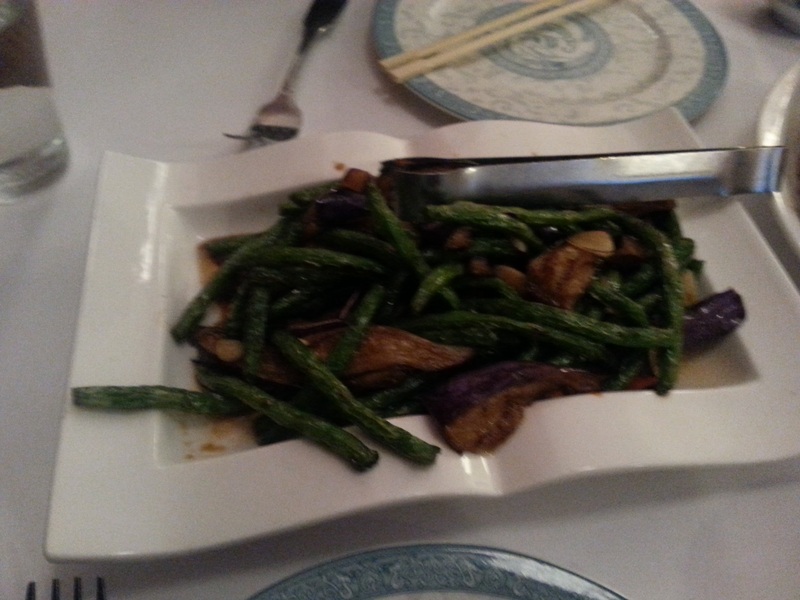 The first dish to arrive was the sautéed green beans. Ordinarily, this is a dish with pork but Tasty Noodle House does a different take: thick, succulent string beans, flavored with garlic and ginger with tiny little shrimps. 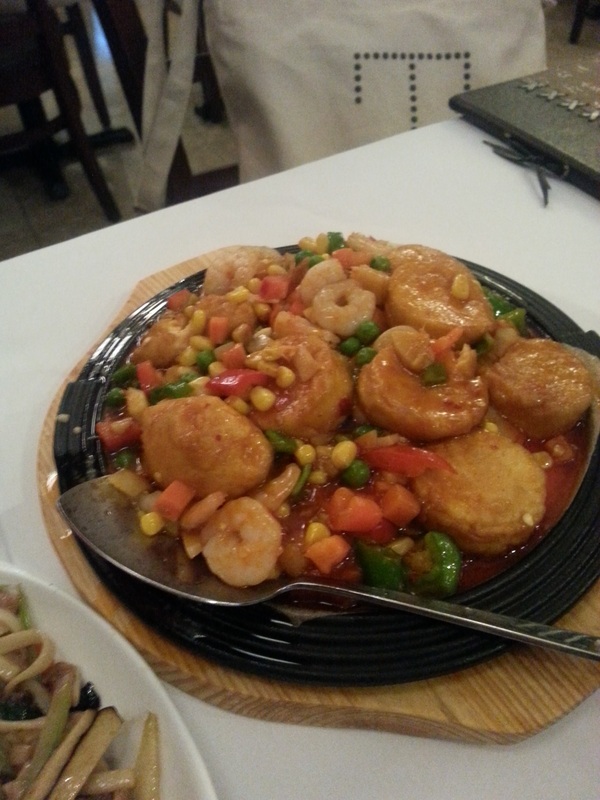 The ginger addition and shrimp were a pleasant surprise and really made this into a light, delicious dish. 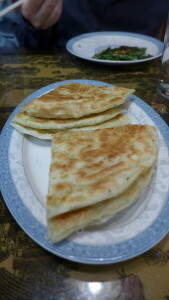 But what came next is what I would term a little piece of heaven: the scallion pancakes. These were thin little things, perfectly crispy and soft, and with only a hint of scallion, not the overpowering flavor that usually fill the pancakes in less refined Chinese restaurants. These pancakes also did not have the grease of a takeout joint and instead appeared to replace traditional Chinese cooking oil with what my dining companions could only conclude was butter. While not traditional, this addition of butter made these pancakes irresistible. 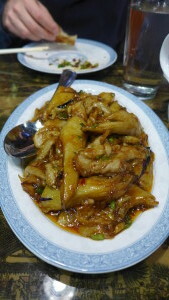 But the highlight of the meal was the Sichuan eggplant (鱼香茄子). 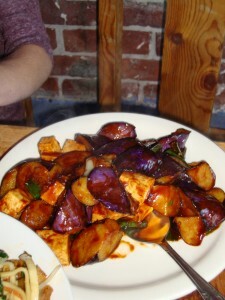 This is by far the best Sichuan eggplant I have had in a long while. 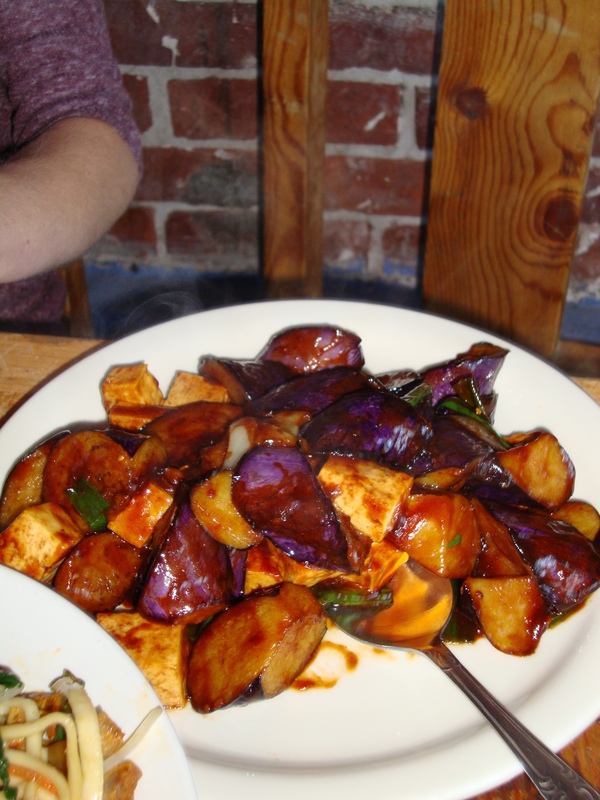 The tough purple skin was not to be found on this eggplant, allowing the eggplant itself to take on the flavors of the sauce which was exploding with flavor. Although slightly oily than other dishes, this was eaten quickly by my dining companions. If you like eggplant, this is a must order dish. 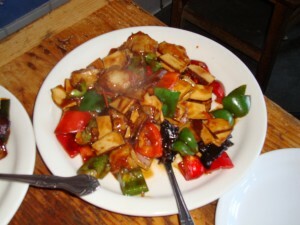 World’s best Sichuan Eggplant? Yes! 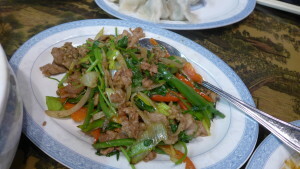 And while Tasty Noodle House does amazing things with its vegetables, its meat dishes are not to be overlooked. Because we were only ordering one meat dish, the waitress informed us that the best meat dish on the menu is by far the sliced lamb pan fried. She was right. The lamb, a good, lean cut, was delicately balanced by the very fresh vegetables that also came with the dish. All too often lamb dishes in Chinese restaurants are nothing more than a vehicle for cumin, with the cumin overpowering all other flavors. But not at Tasty Noodle House. 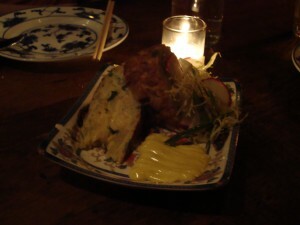 Instead, the chef truly understands subtlety and allows the flavors to work with each other. Finally, while Tasty Noodle House has pretty amazing dumplings for a restaurant that is not a dumpling house. These are not store bought dumplings either. The waitress informed us that all dumplings are made on site, even the skin of the dumpling is made there. We ordered the leeks and fish boiled dumplings and the filling to dumpling skin ratio was almost perfect, with the filling bursting with fish meat and skin adding only a supporting role. flavorless dishes. The chef – from the Dalian region of China – truly understands how to play with flavors, allowing each to play its role in the carnival of flavors in your mouth. bank. For my three friends and me, the total bill with tip came to about $84. Note that Tasty Noodle House does not serve alcohol and from what I could see from others, does not allow BYOB. But you don’t need it here. I will be returning to LA in the spring and rest assured, there will be another trip to Tasty Noodle House so I can order the rest of the menu. I can’t wait to see what else the chef has in store. 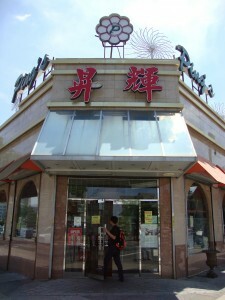 27 W Las Tunas Dr.
For most foreigners in China, baijiu (pronounced bye gee-oh) is a joke, or at the very least, the key element in any story about passing out, blacking out or vomiting up your banquet dinner. But for the Chinese, baijiu, a strong, traditional grain or rice wine, is a must at any celebratory outing. 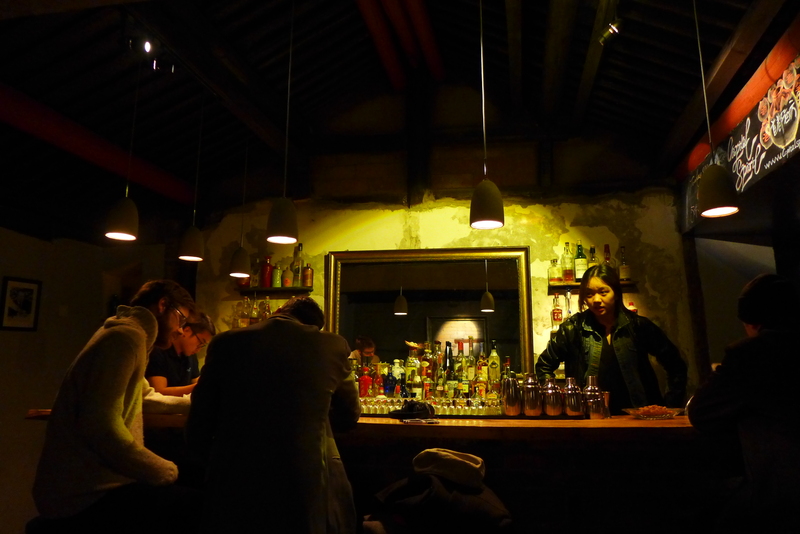 While foreigners often turn up their noses at baijiu, the Chinese really seem to enjoy it. And have so for around 2,000 years. 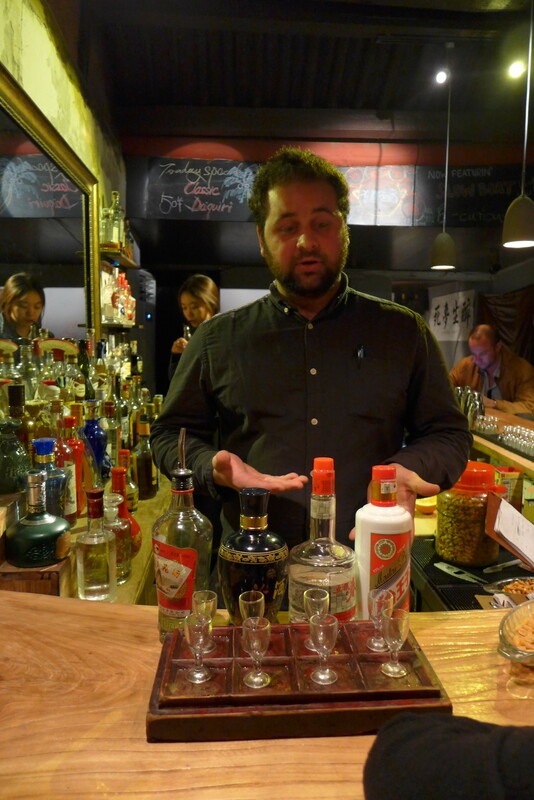 the gap between foreigners’ misunderstanding of baijiu and the Chinese love of it. Showcasing some of China’s finest and smoothest baijius, Capital Spirits gives the uninitiated a reason to respect – if not begin to love – baijiu. The bar offers a number of baijiu flights, where for 40 kuai (around $8), you can taste and compare four or five different baijius from around the country. Each drink in the flight is introduced to you by the bartender, highlighting the differences and history of each brand. But for those who cannot yet face pure baijiu, Capital Spirits also offers an eclectic and inventive baijiu cocktail mix. That is the menu my friends and I ordered off of when we were there one recent night. 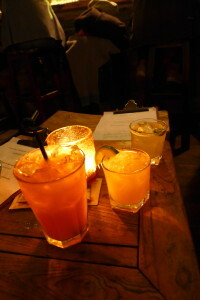 The cocktails were familiar – the hutong hound, a mix between grapefruit juice and baijiu was similar to a greyhound; the pineapple express had elements of pineapple and Malibu; and the ma-la rita, like a margarita. But the taste of baijiu was evident if not in the strength of the cocktail alone. While each was refreshing and tasty, especially the ma-la rita which had an enjoyable Sichuan peppercorn kick to it, because of the baijiu, these were sipping cocktails, not downing ones. If you do want to down drinks in a more traditional manner, Capital Spirits has a full bar (two men were drinking whiskey when we showed up) and a non-baijiu cocktail mix. Capital Spirits’ goal is to convert the doubting to the gospel of baijiu, a task that it appears to be slowly winning. 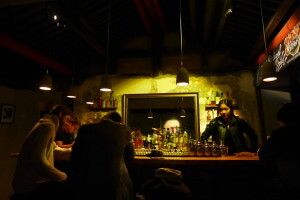 But what it truly does best is create an intimate neighborhood vibe in this small hutong space. This is a crowd willing to try new things, and as a result, willing to talk to strangers. By the end of the night, we had bantered with many of the other customers. David, the bartender that night, was also hospitable, explaining all the different drinks. But if you want to be left undisturbed, that is an option too in this dimly-lit space. I am probably not going to become one of the converted. Baijiu is still a mean spirit, especially for yours truly who thinks Mailbu and pineapple juice is a strong drink. But I am going to go back to Capital Spirits. 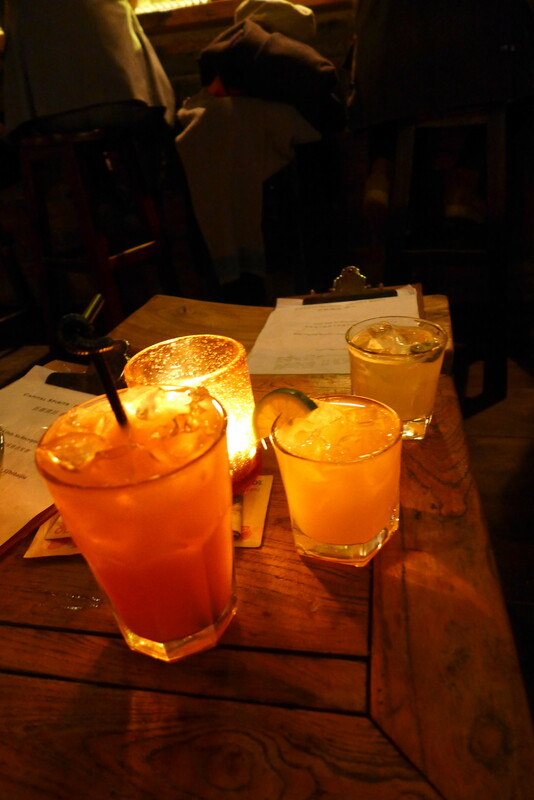 It’s a great place to enjoy a drink – even a non-baijiu one – with a fun group of a people. Note that the bar does not open until 8 PM. It’s not an understatement to say that Chinese tourists likely saved Las Vegas from economic oblivion after the meltdown of 2008. When most of Nevada was in a foreclosure crisis, Las Vegas had to look elsewhere for cash and not surprisingly, that elsewhere was China. Chinese people have long enjoyed gambling: Macau is the most profitable gaming city in the world and the number of Chinese travelers to Las Vegas has risen 30% every year these past through years. In fact, last month, two Nevada congressmen proposed a bill to provide a visa waiver to Hong Kong Chinese. And to thank these Chinese tourists, Las Vegas has given them their just reward – plenty of Chinese restaurants along the strip. 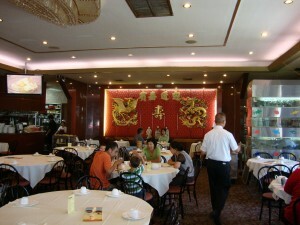 Because if there is something that Chinese tourists like more than gambling, it is eating Chinese food. Some of the fanciest hotels – like the Bellagio and the Wynn – have premier Chinese restaurants allegedly serving “authentic” cuisine. But what China Law & Policy wanted to find out – were any of them good? 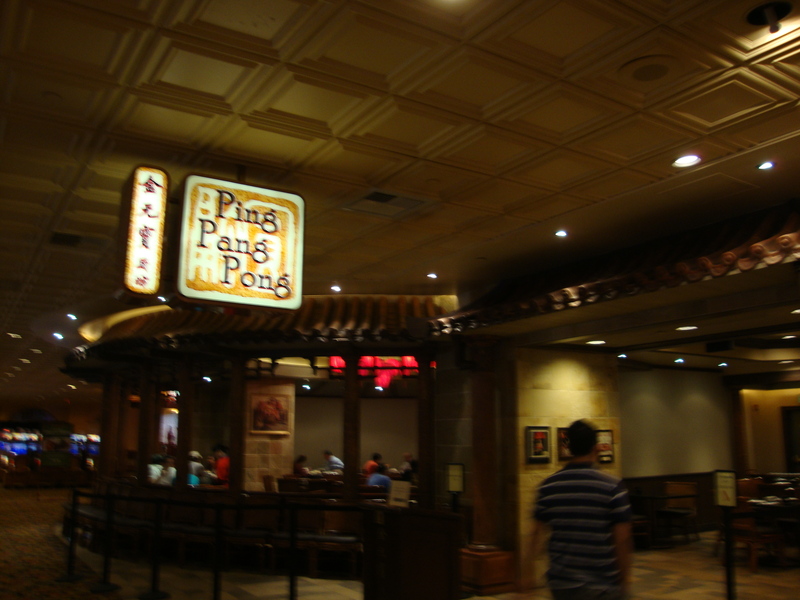 A review of the internet brought up mixed reviews of some of the fancier places, but the one name that kept popping up as the best Chinese food was the unfortunately named Cantonese restaurant Ping Pang Pong in the old school, $5-table Gold Coast Casino. Best roast pork buns outside of Hong Kong? You bet! 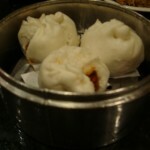 for one thing: some of the best roast pork buns (cha siu bao) outside of Hong Kong. 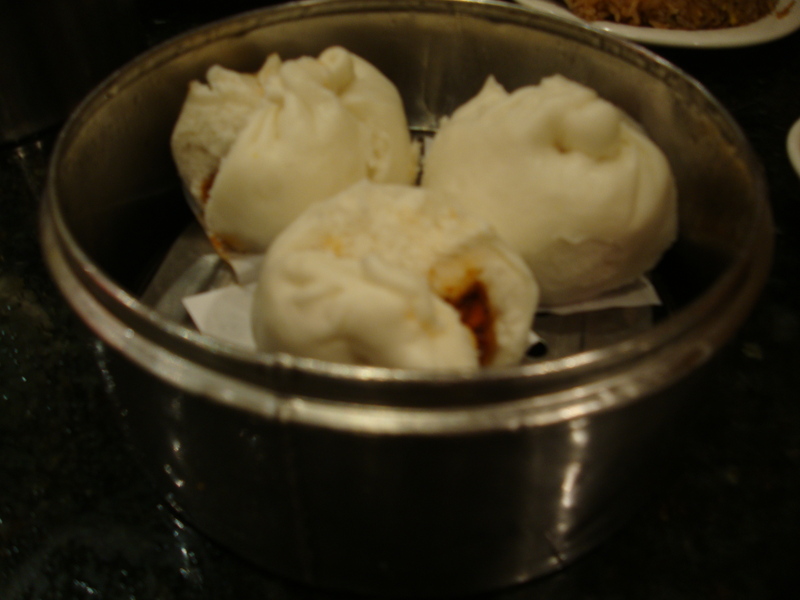 All too often dim sum restaurants give too little attention to the roast pork buns, knowing that it is an easy sell; even a bad roast pork bun is still good. But Ping Pang Pong’s roast pork buns are not simply good, they are actually divine. The attention provided to the pork is amazing – not only is the bun full of shredded pork, but you can actually taste the barbeque flavor of the sauce mixed with the sweetness. The soft bun, which was served hot, was fresh and added a perfect complement to the strong, delicious and distinct tangy and sweet flavors of the meat. This is the way a steamed roast pork bun is supposed to taste. 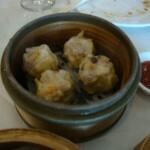 The rest of the dim sum was very solid. 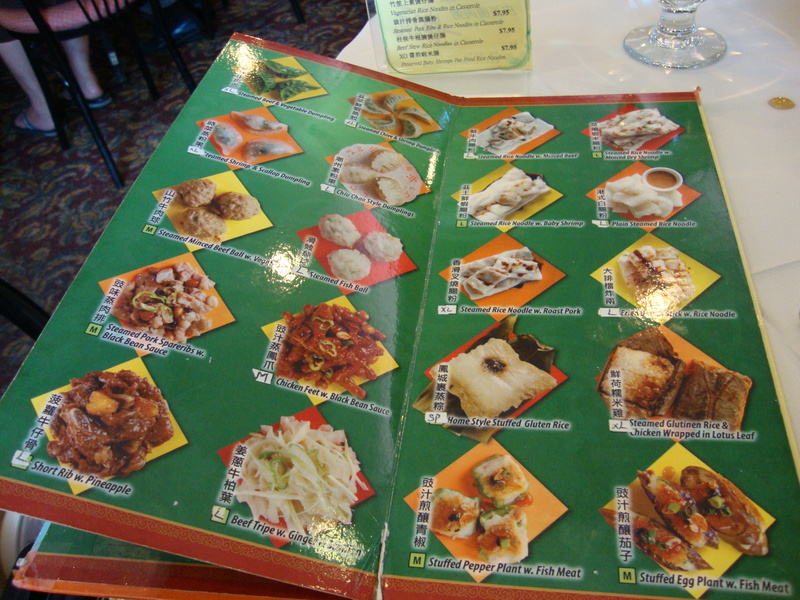 Although the restaurant was full of Chinese and Hong Kong customers (out of the 20 tables, only four were non-Chinese speaking) and most of the ordering is done in Chinese, it is still accessible to non-Chinese speakers because of its picture menu. 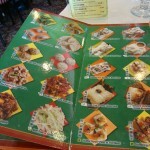 One of the first things that intrigued my dining companion and I on the picture menu was the shrimp lollipops. And these lollipops did not disappoint. If you like shrimp, you will love these. 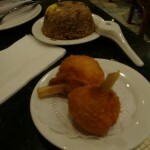 The ground shrimp meat is fried and breaded and sits on a bamboo stick. Although fried, these shrimp lollipops are very delicate – the frying is lightly done with no taste of oil, allowing for the flavor of the hefty amount of shrimp meat to really come out. Even ground, the shrimp was still extremely fresh. There is a mayo-based dipping sauce that comes with the shrimp lollipops, but this only detracts from the flavor. There is no need for any sauce with these hefty shrimp mammas, but if you feel the need, go with the table hot sauce. 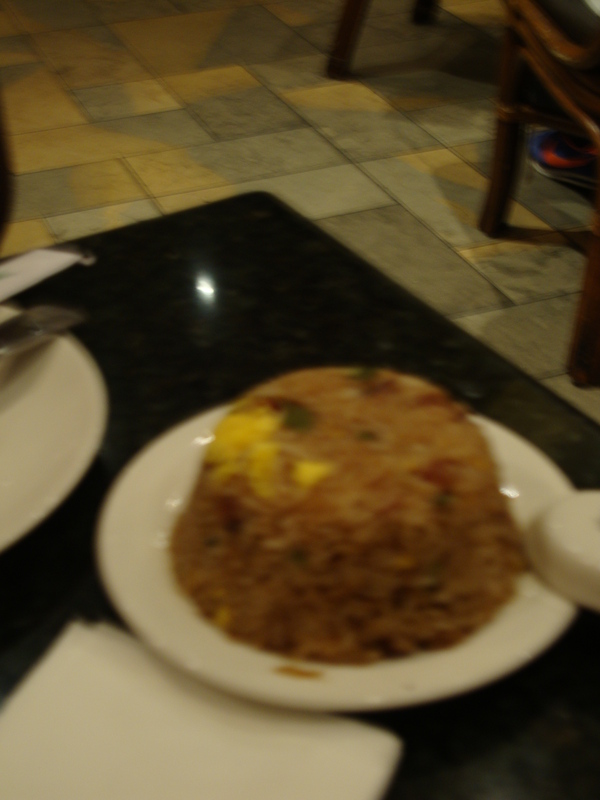 Next we tried the sticky fried rice with Chinese sausage. At first taste, there was not much to write home about. It wasn’t overwhelmingly flavorful, but it was a dish my dining companion and I kept coming back to. The sausage was nice and sweet and the texture of the sticky rice complemented the sausage. This was a dish we ended up making a point of finishing – it turned out to be very savory and satisfying. 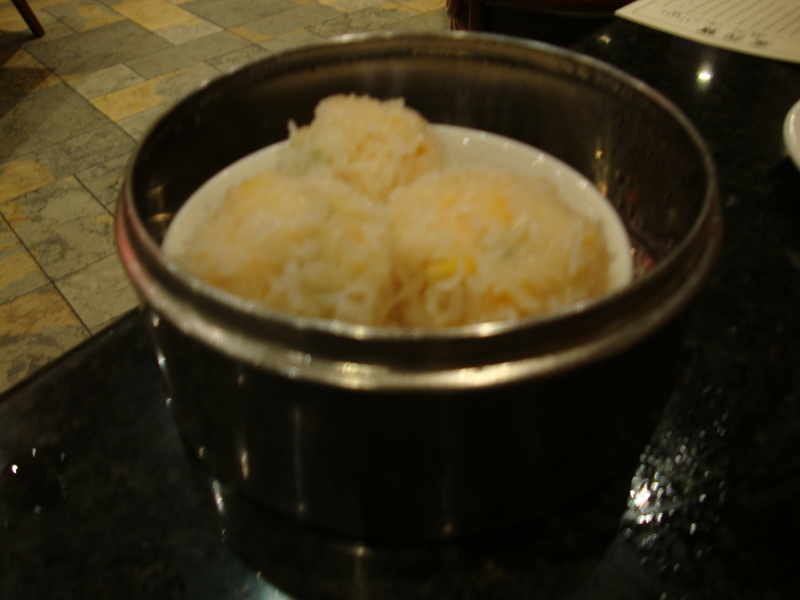 Our next dish was a bit of a mistake – shrimp balls with rice on the outside, sitting in a congee sauce (rice gruel sauce). Mixed with the shrimp was a vegetable medley of sorts – corn, carrots and peas. I would not recommend ordering this. While it is great that Ping Pang Pong is experimenting with new ideas, this is one experiment I could do without. The flavors do not really go together and it’s just weird to mix corn, carrots and peas with the shrimp. Fortunately we were saved by the next dish – the beef and shrimp shu mai. 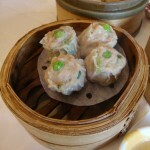 These shu mai were bursting with flavor and were also very savory. The dish did not come with a sauce and to be honest, it wasn’t needed. A sauce would again detract too much for the freshness of the meats. We also ordered off the menu – spinach with garlic sauce. 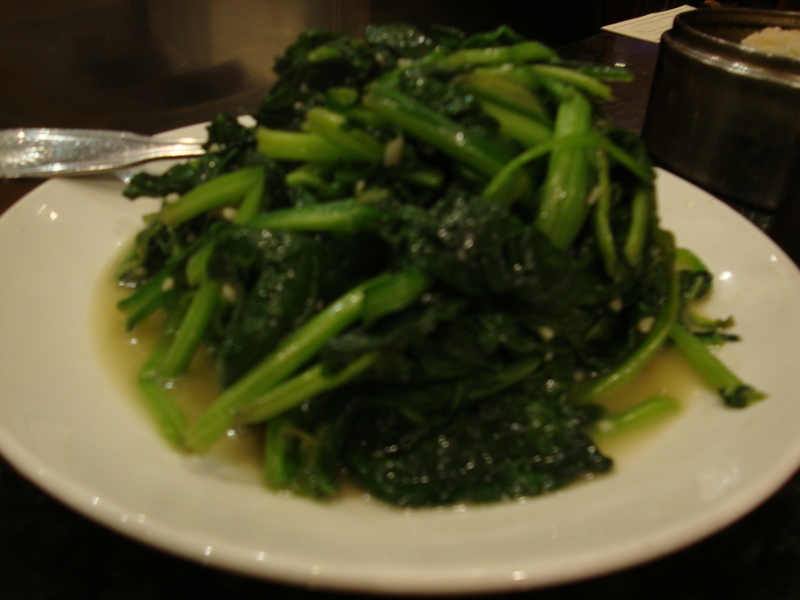 The dish was good – it was not dripping with garlic sauce which meant that the flavor of the spinach wasn’t lost as all too often happen – but it wasn’t great. 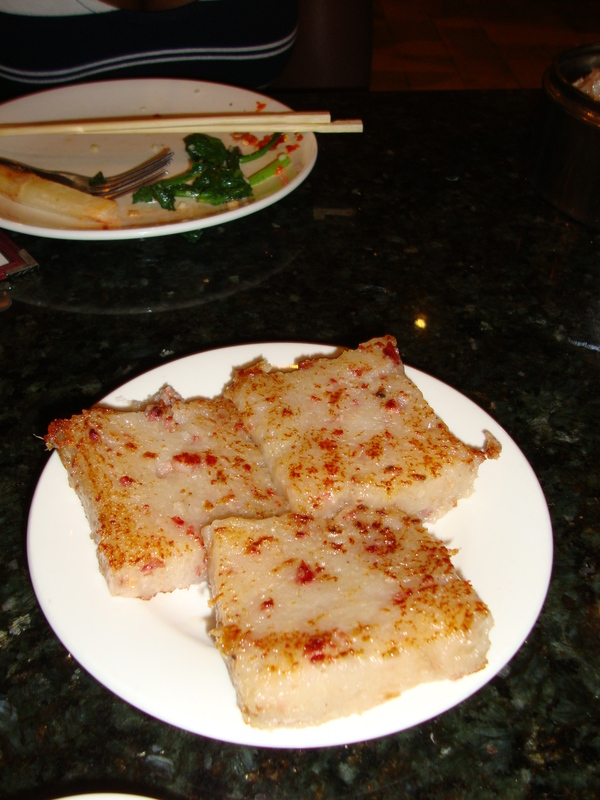 Finally, we ordered one of my favorites – turnip cakes. These turnip cakes were fresh out of the oven, an experience I never had. As a result of their freshness, the cakes fell apart very easily when you went to pick them up with your chopsticks. 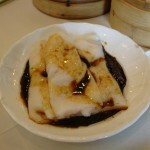 Also surprisingly, these turnip cakes did not come with the oyster sauce that usually accompany them. 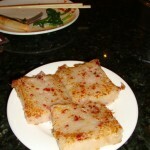 The waitress was happy to oblige when we asked for it, but I have never seen turnip cakes without a sauce. These turnip cakes were good – my dining companion enjoyed them more than I did – but nothing you can’t get in New York City’s Chinatown. 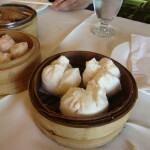 Ping Pang Pong offers very good dim sum with exceptional roast pork buns that should not be missed. 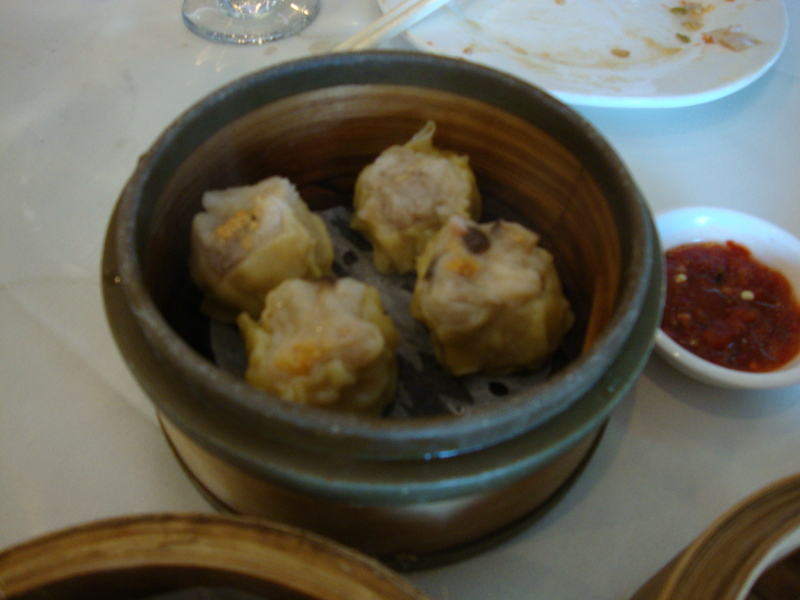 The food is authentic and can compete with some of the better dim sum restaurants of larger Chinatowns like New York and San Francisco. It also can compete with many of the Strip’s more famous chefs. Whoever the chef is of Ping Pang Pong, his genius is evident in the roast pork buns – Emeril could learn a thing or two from him. 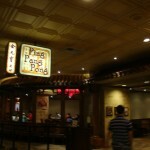 What’s also great is that the meal will not set you back in the way that one of the restaurants on the Strip will. 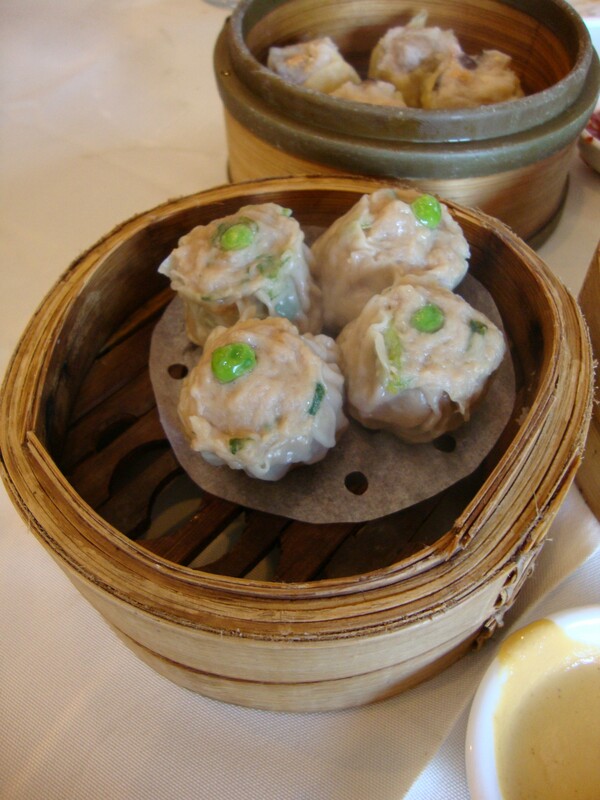 The prices of the dim sum dishes range from $2.18 to $5.88 for a specialty. Our meal – in which we over ordered – was $35 with tip (no alcohol though). Certainly a winning find after losing big the night before in blackjack. Shrimp rice balls with vegetable medley. 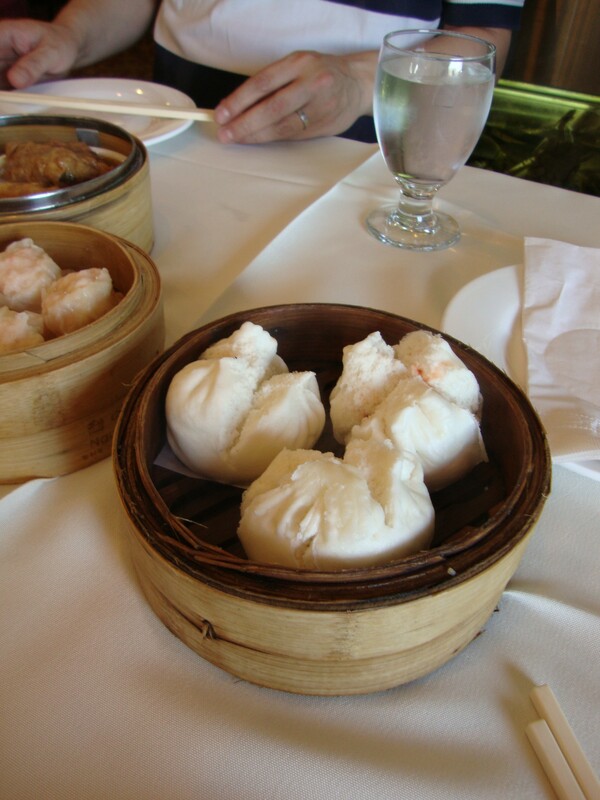 I have a friend who, when he visits New York, needs to have dim sum. Flushing is the usual spot to hit up for dim sum, but this time, we decided to explore a new and up-and-coming Chinese neighborhood in Queens: Elmhurst. 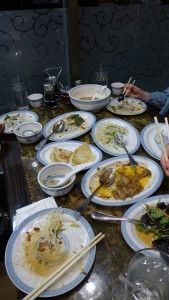 And that is how we found ourselves at Ping’s Seafood, a small, inconspicuous restaurant on the corner of Queens Boulevard and Goldsmith Street that specializes in Hong Kong dim sum. 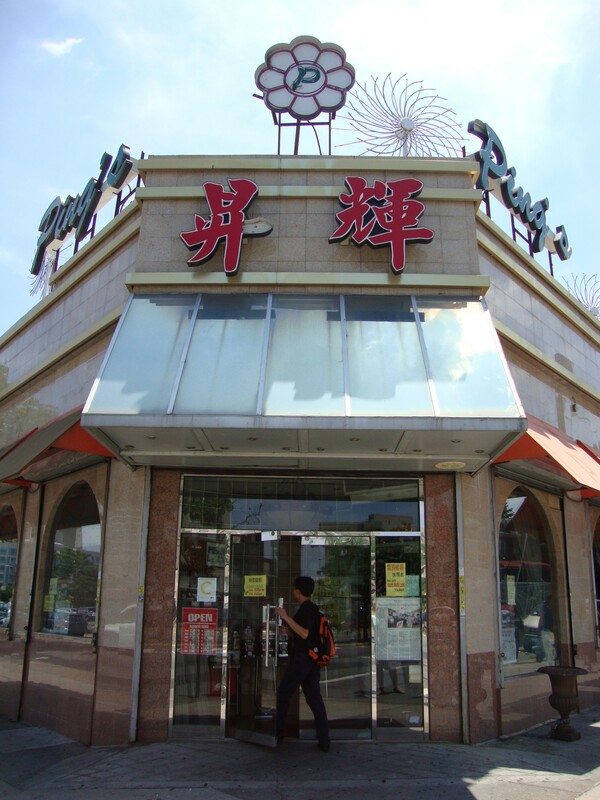 Elmhurst is considered Queens’ “second” Chinatown, but rest assured, there is nothing second class about Ping’s. The entry way itself let’s you know that. Laminated and yellowed restaurant reviews from such renowned newspapers as the Queens Chronicle fill the vestibule; pictures of the chef with the famous and influential of New York, including Mayor Bloomberg informs the visitor: this is not a place to toy with. 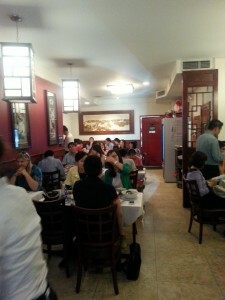 Unlike the jumbo dim sum restaurants of Flushing, Ping’s is relatively small and as a result, quaint. 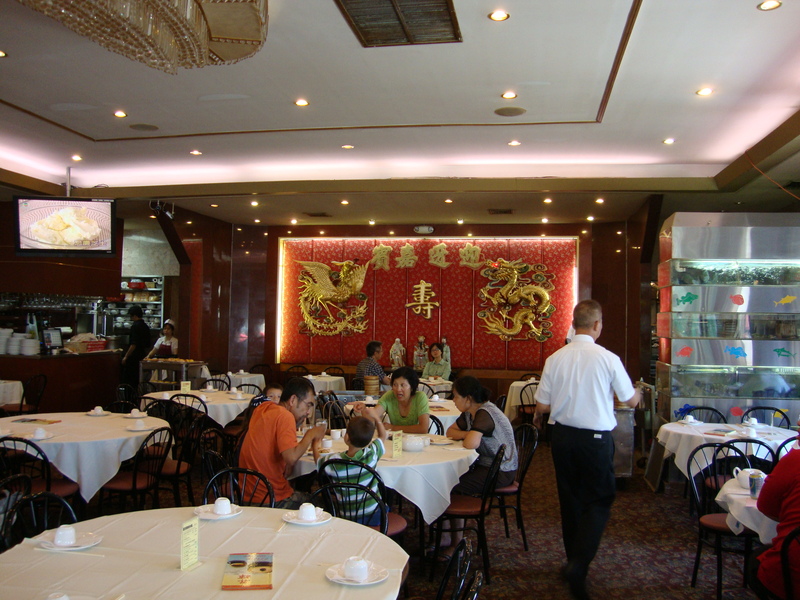 The requisite red velour wallpaper with a massive, gold double happiness symbol fills the back wall of the restaurant but the front wall, covered with windows, allows in a tremendous amount of light (most Flushing dim sum places have few if any windows). Floor to ceiling tanks of various crustaceans blissfully unaware that their end is near are found throughout the restaurant. If the name of the restaurant didn’t give you the hint, the tanks sure do: this is a place to order seafood. pushing carts is how you get your thrill, Ping’s provides that, even on a weekday. 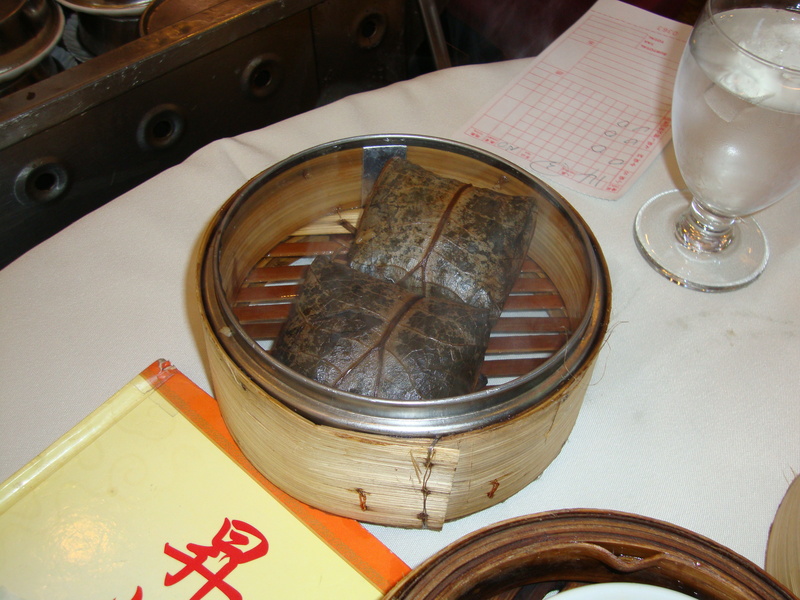 But if you have been put off by dim sum because you have no idea what could confront you when you unwrap that lotus leaf, Ping’s provides a radical, alternative way to order dim sum: a cardboard menu with clear pictures and a description in both Chinese and English. For one of my dining companions, this was the most important aspect of Ping’s for it democratizes dim sum and unwraps the mystery of the gloriousness of the experience. If I was of lesser moral character, I would have swiped a menu to keep. 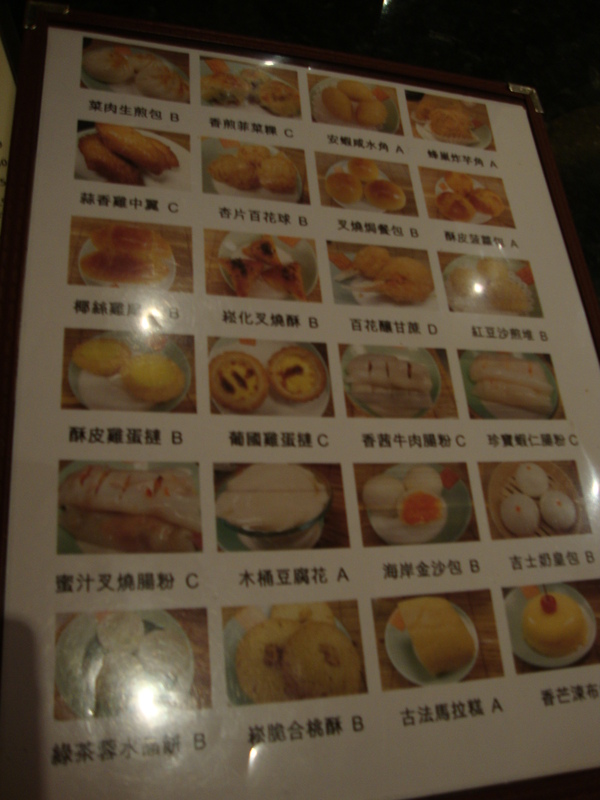 Dim sum is pretty much dim sum everywhere and this menu is the dim sum decoder. 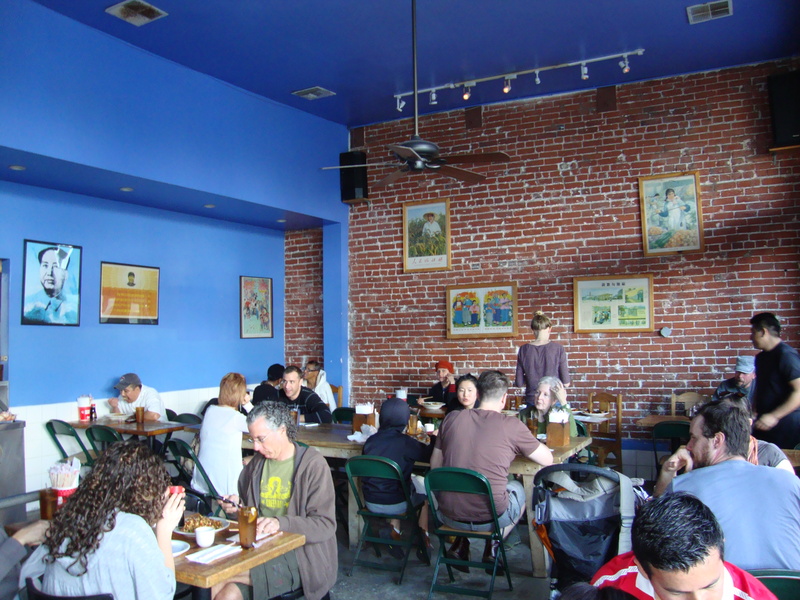 But Ping’s greatness does not just lay in its user-friendly accessibility. 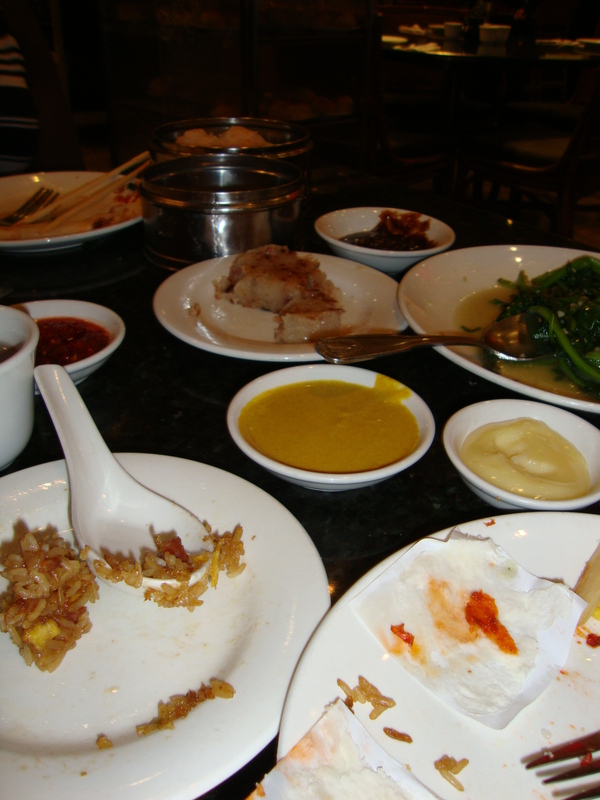 The food was also solid: there were some dishes that far exceeded my expectations, a few that disappointed, with most providing a steady and good dim sum experience. 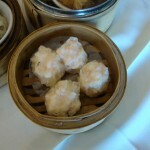 The seafood shumai were pretty amazing; the dumpling was bursting with shrimp flavor and was very fresh. The same held true of thee steamed rice noodle with baby shrimp: a lot of shrimp-bang for your buck and the rice noodle was perfectly moist. 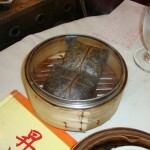 But perhaps the best dish and a dish that should not be missed is the steamed glutinous rice & pork wrapped in lotus leaf. The rice had a light sweet taste to it and the texture was both sticky and slightly crunchy, making for a fun and delicious experience. 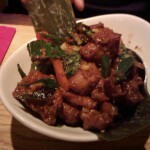 The pork turned out to be crispy sausage with a lot of pork and spice flavor, adding a perfect complement to the sticky rice. 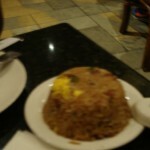 Ping’s Steamed Glutinous Rice is perhaps some of the best in the city. 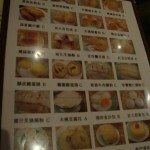 For me, the barbequed roast pork bun was a bit of a disappointment. 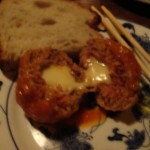 I found the pork too sweet and the bun was a bit too dry. But one of my dining companions loved that the pork was extra sweet and thought that it was delicious. I let him finish off the third bun. 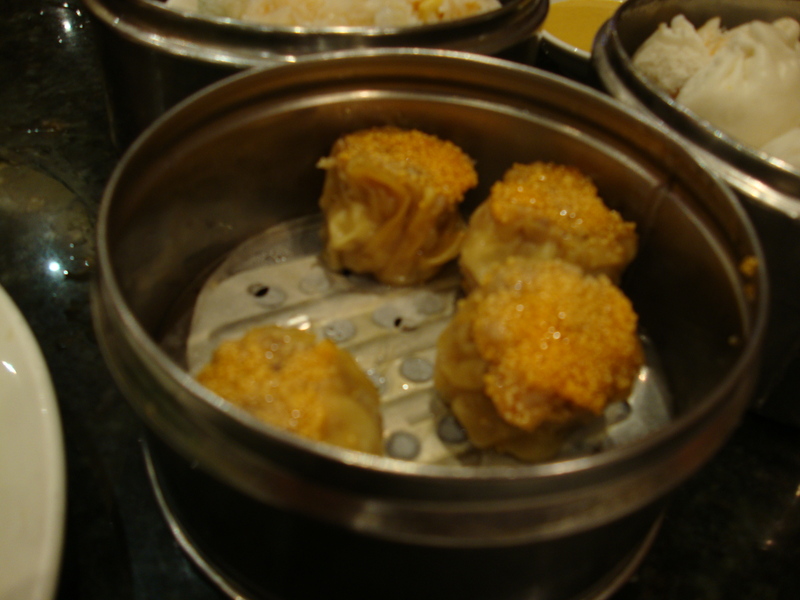 We next ordered a series of dumplings – steamed shrimp dumplings, steamed pork shumai and steamed minced beef shumai. As with all the shrimp dishes at Ping’s, the steamed shrimp dumplings were excellent – the shrimp very fresh and very full. The texture of the dumpling wrapping was perfectly light and sticky, offering only a hint of an additional flavor and allowing the shrimp to steal the show. 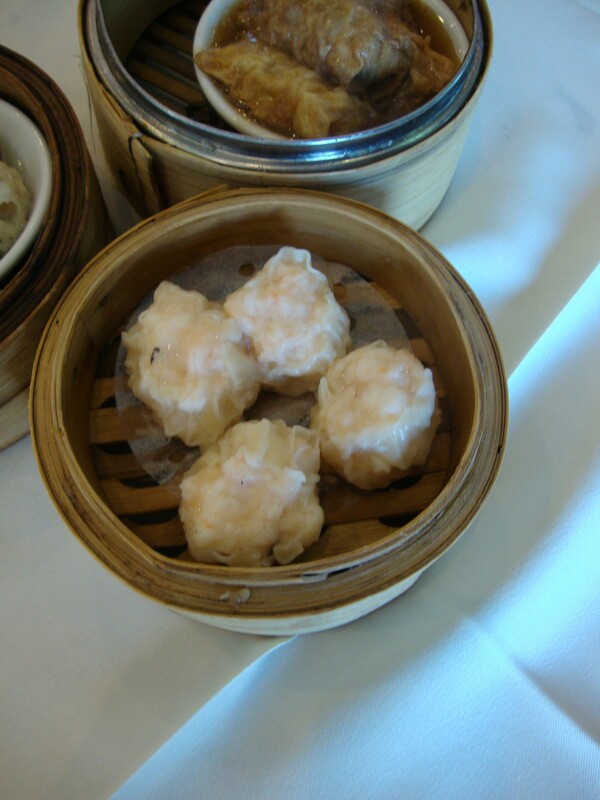 As pork is an important meat in the Chinese culture, I expected the pork shumai, like its shrimp brethren, to be good. But in fact it wasn’t. 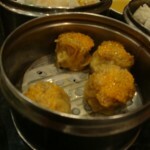 The pork shumai was perhaps the biggest disappointment of the day and any trip to Ping’s should NOT include it. 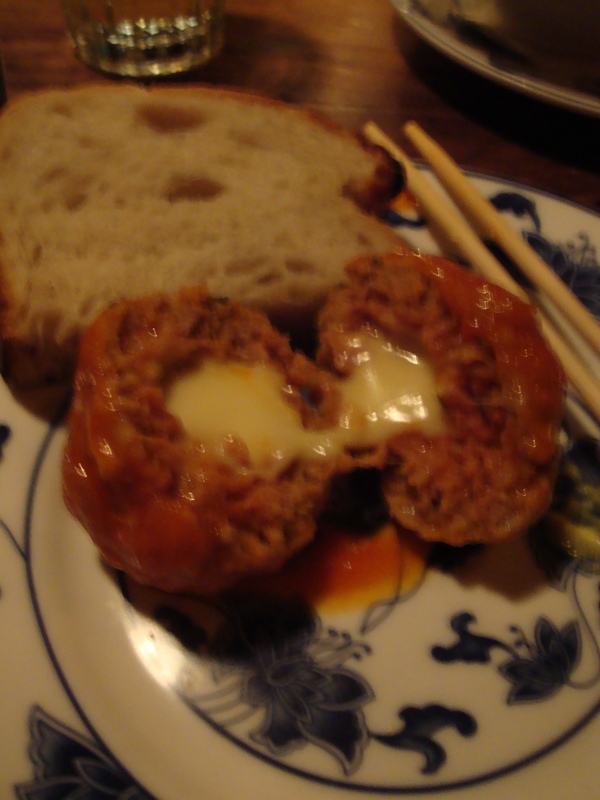 Even my roast pork bun-loving dining companion thought the pork shumai was bad. But not bad enough that we didn’t finish it. 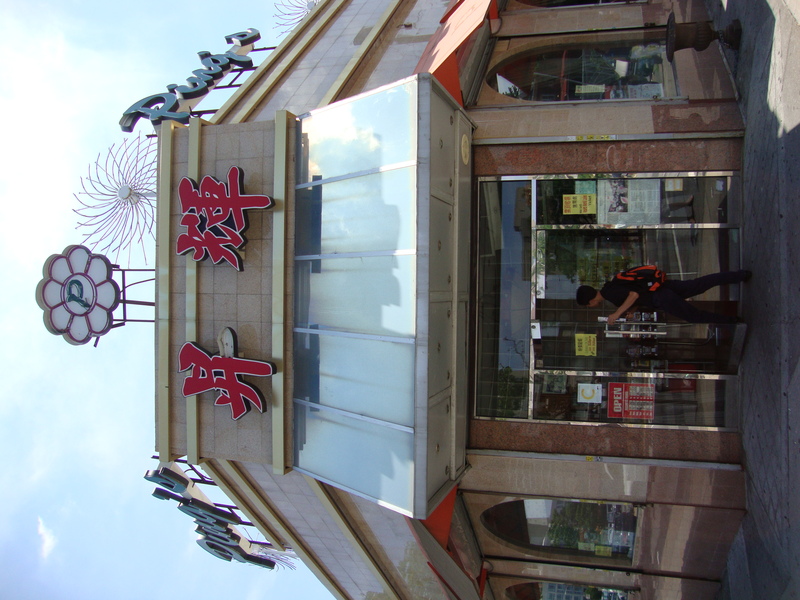 Ping’s throws down the gauntlet: look out Flushing, Elmhurst is on the rise. 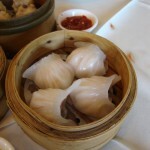 Ping’s dim sum is well worth the trip: it’s a nice restaurant with better than average dim sum and the best sticky rice in the city. 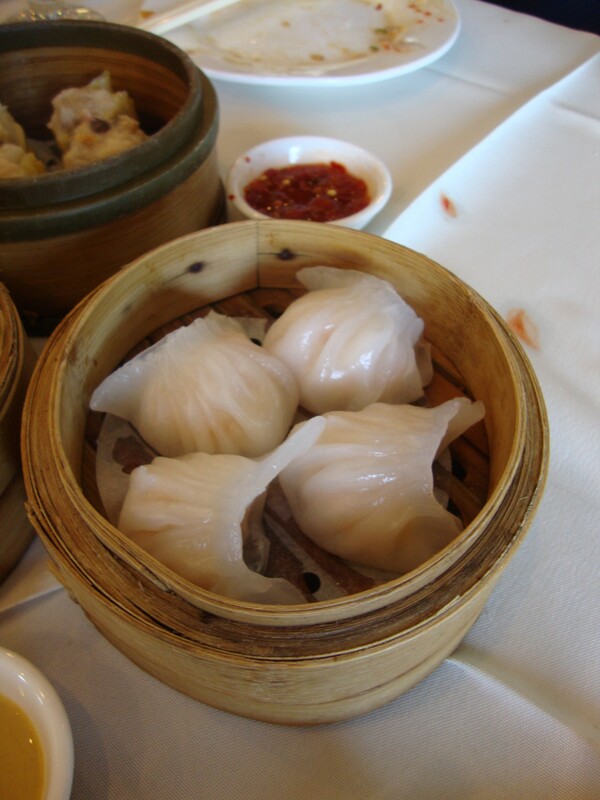 It’s also a great experience for a dim sum first-timer. Given that it is one of the few dim sum restaurants in Elmhurst, expect the weekends to be packed. Is it possible to go to a foreign country, live there for a number of years and remain completely unchanged? In the case of British cuisine, the answer is a resounding yes. Although England ruled countries with the world’s most flavorful food, the Brits never thought to incorporate any of the newly found spices into their own cuisine. But while British food has remained unchanged, major cities in the U.K. are filled with foreign restaurants, which have a good number of British customers. 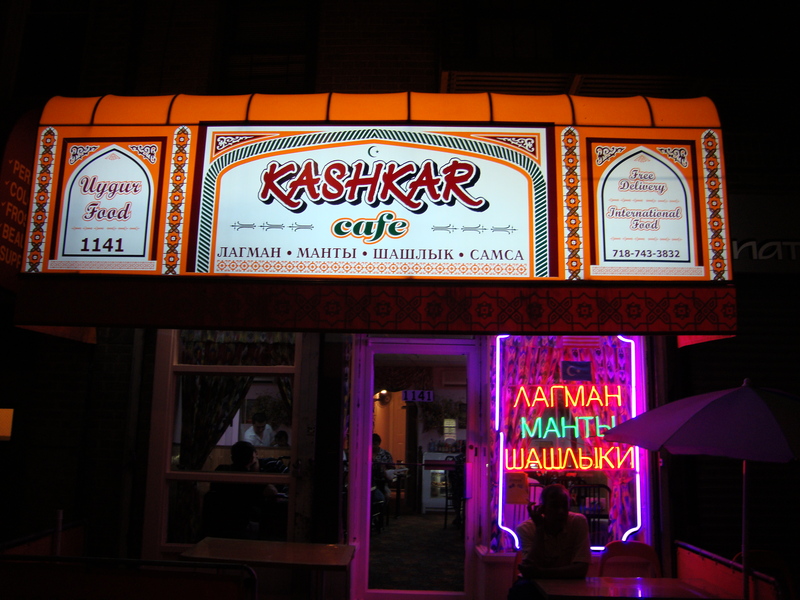 By choosing not to create a fusion cuisine, the Brits have guaranteed that cities like London have some of the most authentic ethnic restaurants; arguably the best Indian food outside of India can be found in London (major props to Masala Zone – yes it’s a chain, but it was phenomenal). But what about Chinese food in London? For over 100 years, England ruled the island of Hong Kong and made significant inroads into the Mainland prior to the Communist takeover, with major concession areas in Shanghai and Canton. 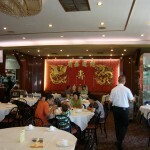 But unfortunately, the number of good Chinese restaurants in London is scant. 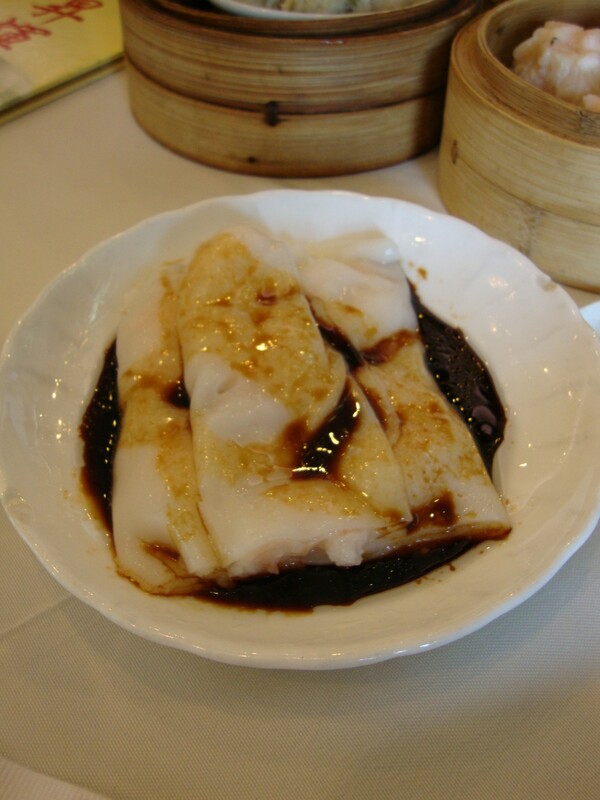 In speaking with a London friend who spent many years in China, she noted that there were only around three good Chinese restaurants in London, a disappointment indeed. 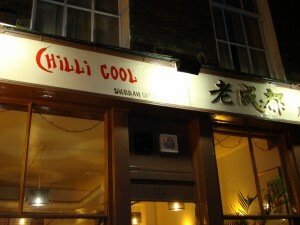 And that is how I found myself at Chilli Cool (the misspelling of “chili” is intentional), one of the recommended three, in the Kings Cross area of London. From the moment you open the door to the restaurant, Chilli Cool is unmistakably Sichuan, with the smells of the region engulfing you- a very promising sign. 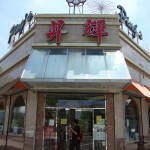 Additionally, Chilli Cool compromises two restaurants, one that serves Sichuan hotpot and one that serves appetizers dishes. My friend and I opted for the main restaurant to try the dishes. 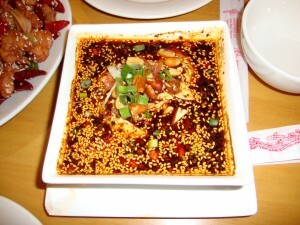 The first dish we ordered, Sichuan Savory Hot Spicy Chicken (No. 6), a traditional Sichuan appetizer where the Chinese literally translates to “mouth-watering chicken”, was not just dead-on authentic but delish. 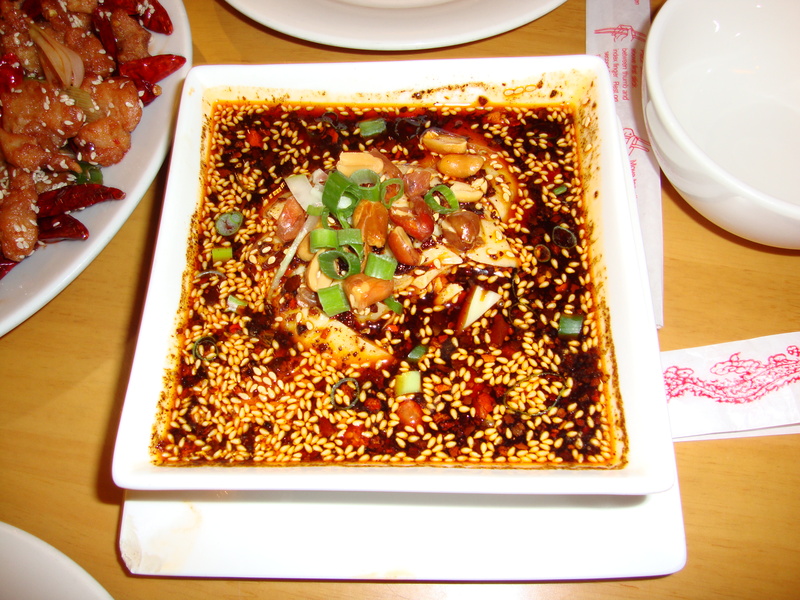 The chicken, served in a bowl drenched by a Sichuan hot sauce and sesame seeds, was tender and although the dish is filled with a canopy of spices, the flavor of the chicken (which is served cold) is not lost. Instead, the spices only enhance the flavor. The chili is the main flavor of the dish, but the subtle smokiness of the black pepper serves as a wonderful compliment. Any trip to Chilli Cool is incomplete without ordering the Sichuan Savory Hot Spicy Chicken – Chilli Cool offers the best version of the dish that I have had outside of China. name of the dish signaled that two dishes would be virtually identical and our waiter did not let us know that perhaps choosing two of the same dishes was not a good idea. Fortunately, the chicken version came out first and was amazingly good and flavorful; if one had to choose between the two dishes (which one should otherwise it is repetitive), the chicken version is by far superior. 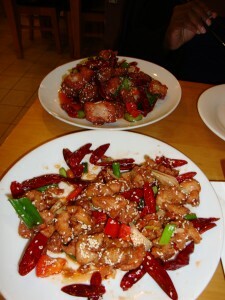 The chicken was lightly fried and breaded, giving the dish a lightness that is often not found in fried Chinese food. For those with a more delicate palate, the dish was not overwhelmingly spicy and was bursting with flavor. 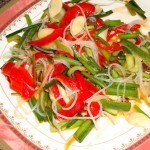 The scallions, onions and peppers were fresh and perfectly complemented the mild chili flavor. However, the dish likely could have used a touch more cumin as that flavor went largely unnoticed. As for the pork version, the spare ribs were a bit dry. Additionally, the flavoring of the dish tastes better with chicken. Arguably other pork dishes on the menu would be a better choice. rice. Unfortunately, Chili Cool could not have made it more wrong. 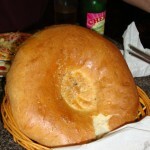 The dish, which is usually very lightly fried, came out drenched in grease. If made right, the potato slices should be firm; in the Chilli Cool version they were soft and soggy. For some reason, Chili Cool added cloves to the dish which was weird and messed too much with the flavor. Our Shredded Potato dish remained untouched during our meal. Although one of the dishes was largely inedible and we were not properly warned that two of our dishes were twins of each other, I would still recommend a visit to Chili Cool when in London. Two of the dishes were pretty amazing and could easily compete with the Sichuan chefs of Chengdu or Chongqing. However, it might be best to stick with the traditional Sichuan “appetizers” (like dan dan noodles and Sichuan dumplings). 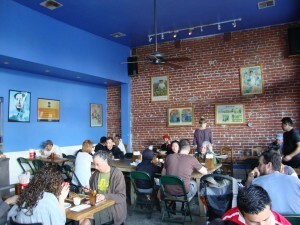 However, do note that Chilli Cool is no where near “Chinatown cheap.” With four dishes and one beer, Chili Cool set us back 40 pounds (approximately $63), a lot of money considering two of the dishes were not that great. Chilli Cool holds promise to be an amazing experience but a more careful selection from the menu is necessary. Macau may be a tiny island neighboring Hong Kong, but it has an air larger than life. The first and last European colony in the Far East (the Portuguese arrived in Macau in 1557, leaving 400-odd years later in 1999), Macau still maintains the romantic feel of its colonial past, where East meets West in the culture, architecture and food. But with the romantic, there is also the illicit air of Macau’s colonial past. As the gambling mecca of Asia since the 1850s, organized crime has permeated, controlling Macau’s largest industry – the casinos – and in many ways, its government as well. But it’s this feel of illegality that makes Macau attractive and the backdrop for some of Hong Kong’s best gangster films. 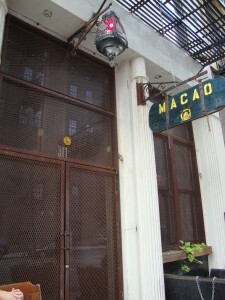 So when my friend suggested that we have dinner at Macao Trading Company in New York City’s Tribeca, I was excited at the chance to be transported back to the mysterious and dark Macau. 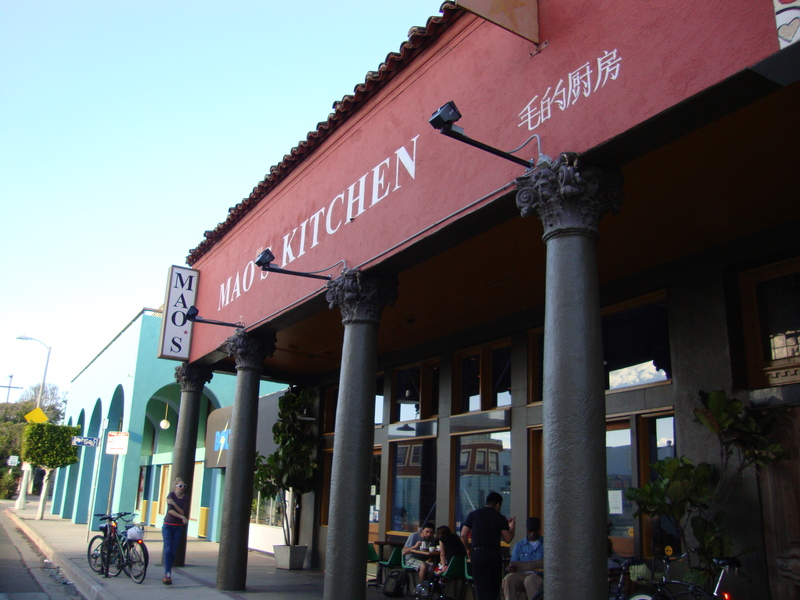 Unfortunately, Macao Trading Company doesn’t exactly live up to its namesake, but not for want of trying. The bar area of the restaurant could easily be found in the streets of Macau, with strong teak wood elements, Buddha statutes, and iron fans. But as I sat there, sipping on a glass of Portuguese wine, waiting for my dining companions, I realized that the fault lied more with the customers. Americans just don’t do colonial sleazy nearly as well as their European counterparts; we are too earnest I suppose. But in order to help overcome such a deficit, the bar offered a wide selection of drinks, with specialty cocktails starting at $14 each (including a $15 mai tai). Stick with the Portuguese white house wine. It was tasty and refreshing on a hot and humid New York City summer night. As soon as we were seated, we immediately ordered a carafe. Chinese ones, with some Chinese dishes oddly of the Sichuan-style rather than Cantonese (which would be the native type of Chinese food in Macau). We decided to start our adventure with a Portuguese dish – Tortilha do Macao – a lump of crab meat and potato, with a curry dipping sauce. It was a heavy mix, with a comfort-food type texture but without any of the consoling flavors. It was too much potato with almost no flavor of the crab and absent the curry dipping sauce, the tortilha do macao would be a dry lump of nothingness. The Portuguese meatballs (as opposed to the Chinese meatballs) were equally as heavy but with much more of a taste – a very pronounced meat one. Mixing ground lamb with ground pork and a juicy mozzarella center, the Portuguese meatballs were hearty but nothing to write home about. and we are three people who like to eat lamb. But the portion size was good – with more than enough for two servings each. The on-the-bone lamb chops were perfectly tender with a smokey, barbecue taste. 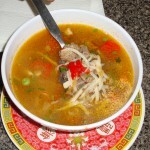 Flawlessly complementing the lamb was a light and savory garnish of bean sprouts, radish, peppers and mango. For me, the mix of these flavors is Macau. My dining companions were a little less impressed, noting that lamb chops are a Cantonese specialty (this I never knew – how many times you go to Hong Kong and see lambs walking around?) and that lamb chops this good could easily be found in Flushing, Queens, at a cheaper price. 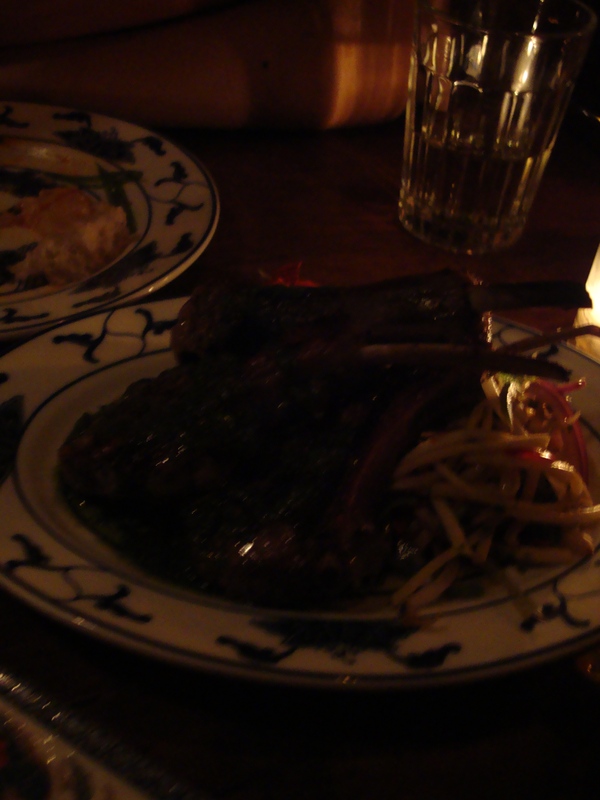 While this might be true, any trip to Macao Trading Company is not complete without these lamb chops. Our next dish was a decidedly Chinese and one of my favorites – Ants Climbing the Tree. 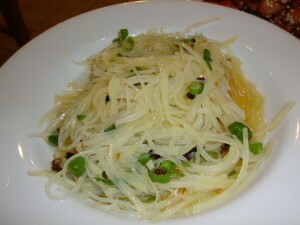 While not an appetizing name, ants climbing the tree is a dish of glass noodles with minced pork and a red chili sauce. It can be a fulfilling, flavorful dish but Macao Trading Company’s version falls far short of the ideal. 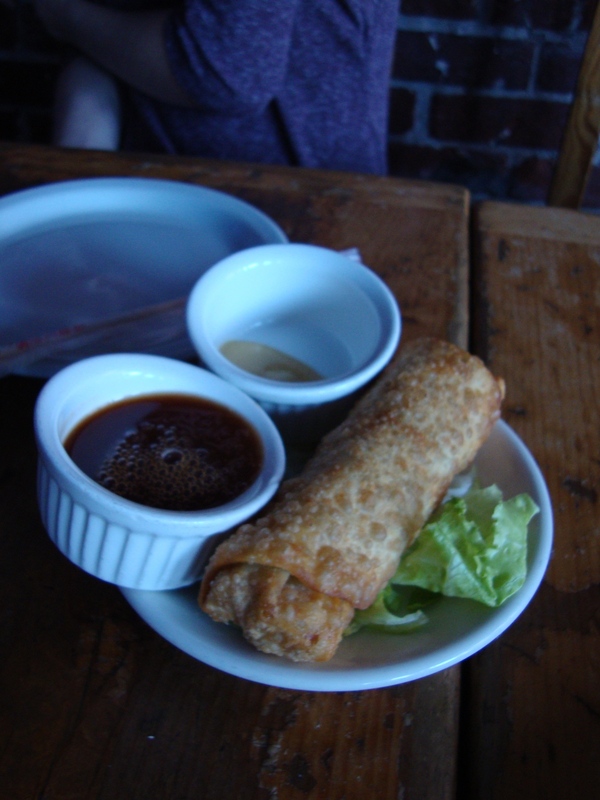 There was no distinction in flavors with the chili sauce overpowering everything else and the noodles too pasty. 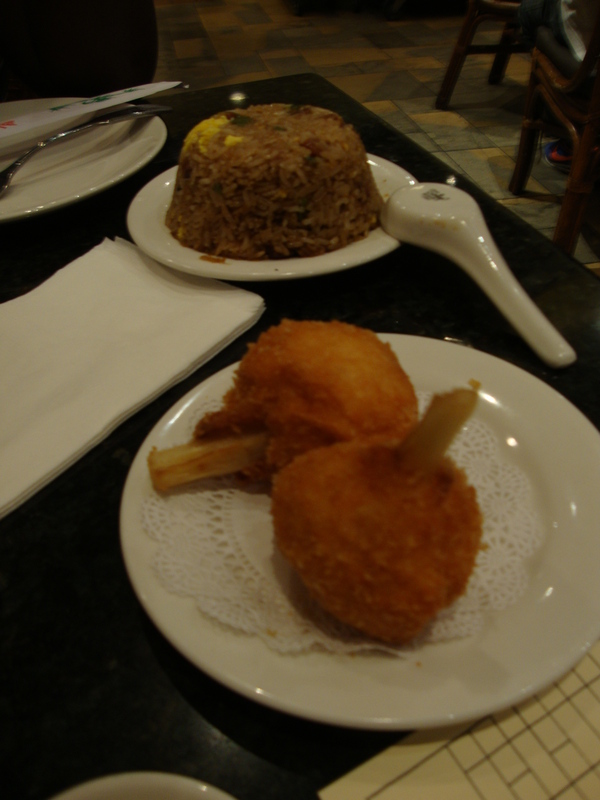 Fortunately we ended our meal with a bang, the Bacalao Fried Rice – a very Cantonese dish that one dining companion commented was a dish her aunt would make if she was feeling experimental (note that in traditional Chinese cooking, the key is never to experiment but rather to perfect). The flavor of the salted cod was perfectly pronounced and the use of jasmine rice was brilliant. 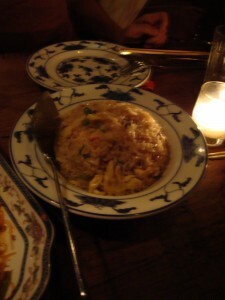 With the lamb chops, the bacalao fried rice was off the charts. With its Tribeca address and dim lit interior, Macao Trading Company, as one of my dining companions noted, is the perfect place to bring your mother-in-law who is visiting from Cleveland and wants a crazy night out on the town. But its neither terribly crazy nor terribly good. At the very least though, the check won’t set you back too much. With five dishes and a carafe of house wine, the bill came to $114 with tip ($38/each). Macao Trading Company also picks up after hours, staying open till 3:30 AM. The heavy food could be good to sop up some alcohol and after a night of partying the lack of flavor in some of the dishes will likely go unnoticed. But in general, Macao Trading Company is average; if you’re in the neighborhood and want ambiance, give it a shot. Just know what to order. Religion successfully moves from country to country by adopting many of the customs and culture of its new host country. Similarly, so does Chinese food. 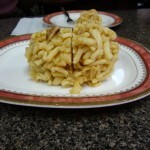 The food you find at a local take-out in Manhattan is different than what you would find on the streets of Beijing. While some sinophiles might turn up their nose to American Chinese food, it is its own distinct cuisine, to be loved and respected for its own separate reasons. And love it I do. But the Chinese have gone all over the world. So what is Chinese food like outside of the U.S.? Is there sweet-and-sour pork? General Tsao’s? Such thoughts blow my mind, sort of like wondering, what is out there after the planet Pluto? 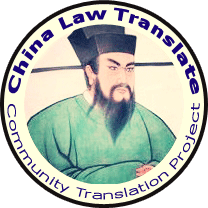 So imagine my excitement last weekend when a friend (and avid China Law & Policy reader!) invited me to join her at an Indian Chinese restaurant. And that’s how I ended up at Chinese Mirch on Lexington Avenue and 28th Street. 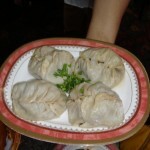 Chinese food is not new to India and in fact likely has a longer history there than in the United States. With the Chinese first settling in Calcutta in the late 18th century, Chinese food in India has had the time to fuse some of the best of both Asian countries. 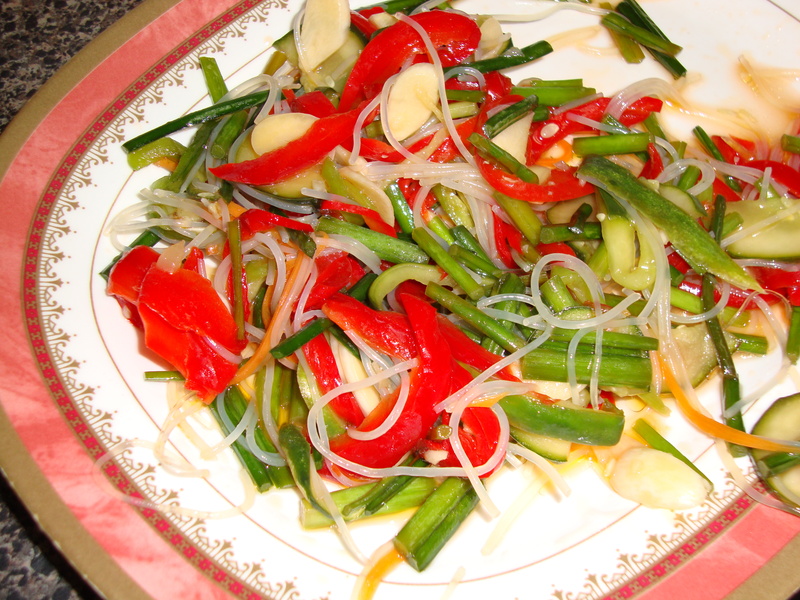 A mix described as “an explosion of flavor, sometimes bold and fiery, but always a delight to the senses,” Chinese Mirch certainly delivered on the bold and fiery, but at times left me without the delight. chilies, named Mirch 65, was intense and not in a good way; more in a “can I have a bigger glass of water” way. I don’t consider myself weak when it comes to spicy, but Mirch 65 had way too much chili, overpowering what otherwise might have been a good dish with fresh, succulent pieces of chicken. Our dish of fried okra though was pretty solid. Nice fresh pieces of okra with a light fried batter and good and crispy. But while it was good, it wasn’t spectacular. But things decidedly picked up with the main dishes. Vegetable ball Manchurian is a must. 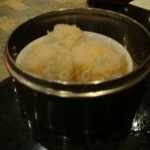 While shaped as little meatballs, it does not attempt to replicate the taste or feel of meat. It knows better than that and does not need to stoop to that level. No, vegetable Manchurian rightfully stands alone. Made of fresh ground vegetables in a minced onion, garlic and cilantro sauce, and lightly fried, the flavors of the fresh vegetables clearly speak for themselves and trust me, what they have to say shouldn’t be missed. 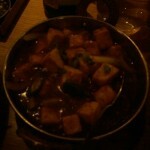 The chili paneer, lightly fried cubes of cheese in a hot soy chili gravy, was close to divine. 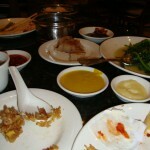 Outside of a few places in China, cheese does not exist and is not found in traditional Chinese cooking. So the paneer is much more of an Indian dish than a Chinese one, but the soy sauce and chili gravy allowed the flavor of the paneer to pop. Likely to the displeasure of my dining companions, I couldn’t stop eating it. By time I knew it, the whole dish was gone. 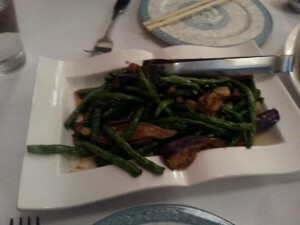 After two marvelous dishes, the crispy Szechuan lamb was a bit disappointing. There wasn’t really anything exciting about it. 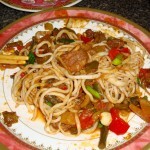 It consisted of good pieces of meat, not at all chewy, with good lamb flavor and a nice chili spice aftertaste. But it wasn’t anything to write home about. Hakka dialect and during the late 18th and 19th centuries, traveled and settled in many places outside of China, including India. While few Hakkas can still be found in China today, remnants of their distinct food can easily be found in Chinatowns that dot the globe. Hence, Hakka noodles from India. 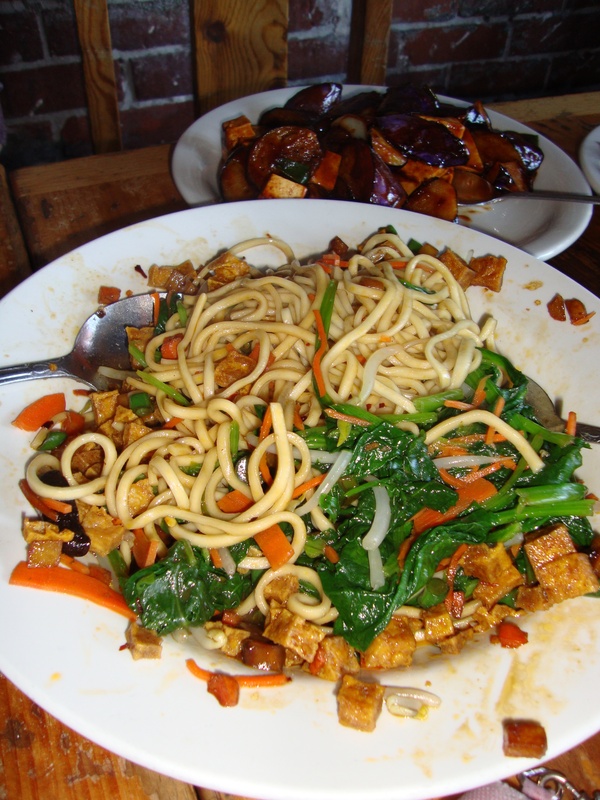 Hakka noodles are so common and popular in India that most young Indians today don’t realize that the dish is not original to India, at least according to one of my dining companions. 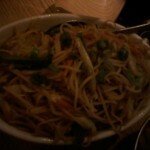 If lo mein is too greasy for you, hakka noodles are a wonderful alternative. Thinner, flatter and less greasy, Hakka noodles do not leave you feeling overly full and gross like lo mein can. 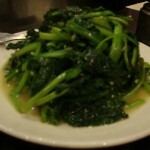 Overall, Chinese Mirch was a good find and I look forward to exploring more of the flavors of Inidan Chinese food. 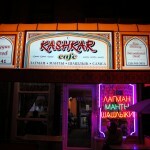 The food has all the savoriness of traditional Indian food but with lighter sauces and flavors. It also makes significantly more use of the chili which in some cases (like the Mirch 65) can be a bit much but in other cases, really makes the dish. 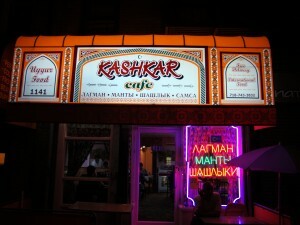 Prices though are reasonable with most dishes around $10. 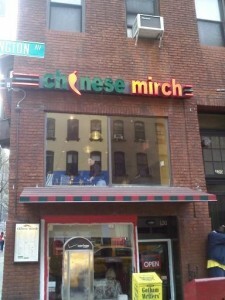 Do note that Chinese Mirch is a rather small restaurant and given the increasing demand for Indian Chinese food, the wait can be long. 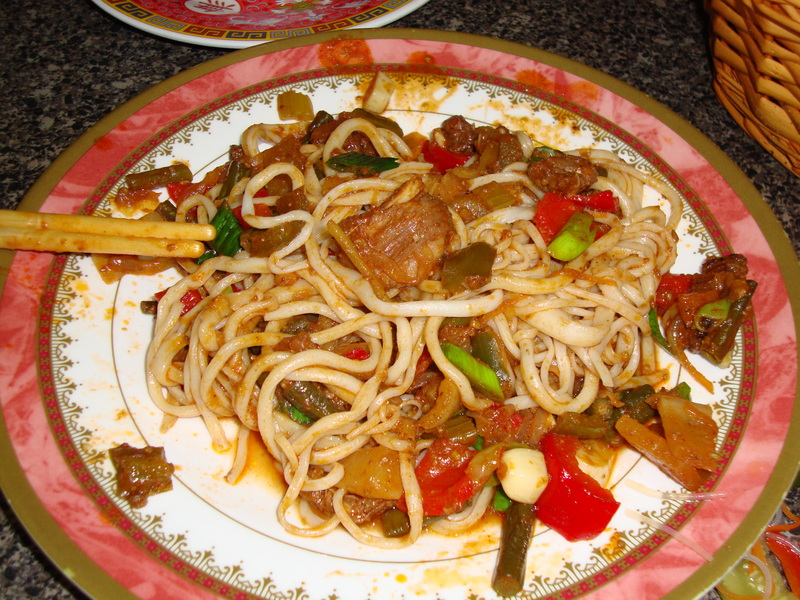 If you would like to try to make some Indian Chinese food on your own, you can find a great recipe here.